Let me start off by saying that you can get this phone for FREE if you are planning to port over to MetroPCS. The same model is also available through T-Mobile (different version) with a $150 price tag, a little higher than MetroPCS, but with no significant difference on the tech specs. Do note that this phone may be cheap, but it doesn’t come unlocked. There’s only one way to permanently unlock your phone and that is through the Mobile Device Unlock app already pre-installed in the unit. The Motorola E5 Play does not boast any fancy features, it doesn’t have a striking look that will make you “wow” in its appearance, but for the affordable price tag, it is no wonder one of the best value budget phones for the year 2018. Although this phone came out together with its brother the Motorola E5 Plus, they are two worlds apart, and the latter is priced a little higher but for good reasons. It has a whopping 5000mAh battery and more advanced tech specs. It runs on the Android Oreo 8.0 and has a 2GB of RAM packed together with a 1.4GHz Quad-core processor. It also has a huge 2800mAh battery that can last you a day on a single charge and comes with a 16GB built-in storage space which is expandable through a microSD card. What makes this model a winner for us for its price is its 3.5mm headphone jack and fingerprint reader located at the back. With these features on board, it tells us that Motorola had been all out on the technical specs and the quality of experience you would get for a budget phone. The Motorola E5 Play is has a straight up plastic back cover- it’s nothing shiny or glass-like on the outside, but it has a huge screen standing 5.2 in tall. This is complemented by good front and rear cameras that both hhavea flash and autofocus features; giving you bright and crisp photos. The back camera is 8MP and the front camera is 5MP. Despite having the tagline “Everyday. 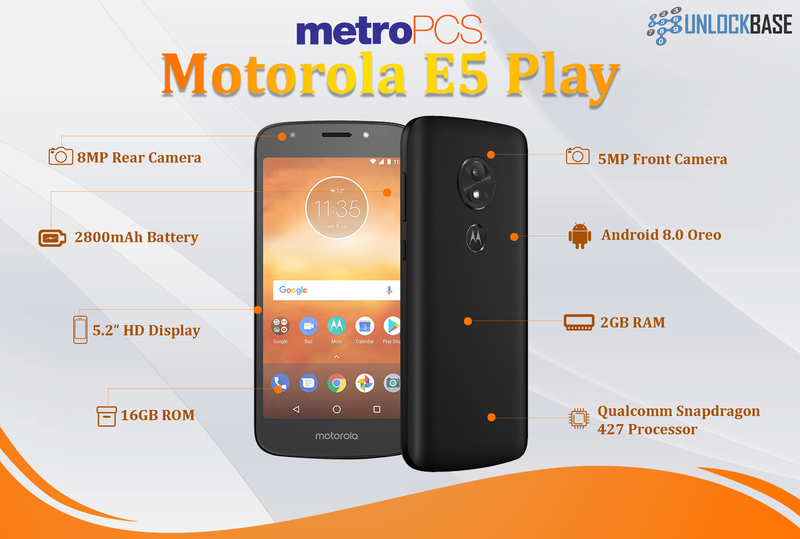 Extraordinary,” there is pretty much nothing extraordinary about the Motorola E5 Play on the outside that would make it stand out; only that it is fairly priced and has decent enough features for a smartphone in 2018. But the unique selling point of this phone compared to the other budget smartphones is its water-repellent coating. It is not waterproof; it is just water-repellent. This means that it cannot survive underwater submersion, but it cannot be easily penetrated by water. It is indeed the bottom line Motorola phone but it doesn’t mean the E5 Play had compromised all the good stuff. It has a remarkably loud and clear speaker, ga ood camera with a flash, and a fingerprint sensor. It’s a bit unfair if we compare the Moto E5 Play to the Moto E5 Plus because they have a considerable price difference, so we will compare it to another phone within the same price range, which is the LG Aristo 2 when it comes to the features. It’s clear to see that both phones have almost similar features. The better phone actually depends on personal preferences, whether you like a big phone like Motorola Moto E5 Play or a smaller phone like LG Aristo 2. If you’re more concerned about the quality of the images and having a better camera, the LG Aristo 2 might be the best for you. But if you are more concerned about power and longer battery life, the Moto E5 Play is clearly the better option. The Motorola Moto E5 is a budget phone so if you plan to get this phone, always remember to manage your expectations. Nothing about it has a wow factor, but it offers a remarkably clean Android experience and all the complete security necessities we would be looking for in a smartphone. With the Moto E5 Play, Motorola has once again proven that they are truly a lord of budget phones always going beyond the price and giving a better experience every time.